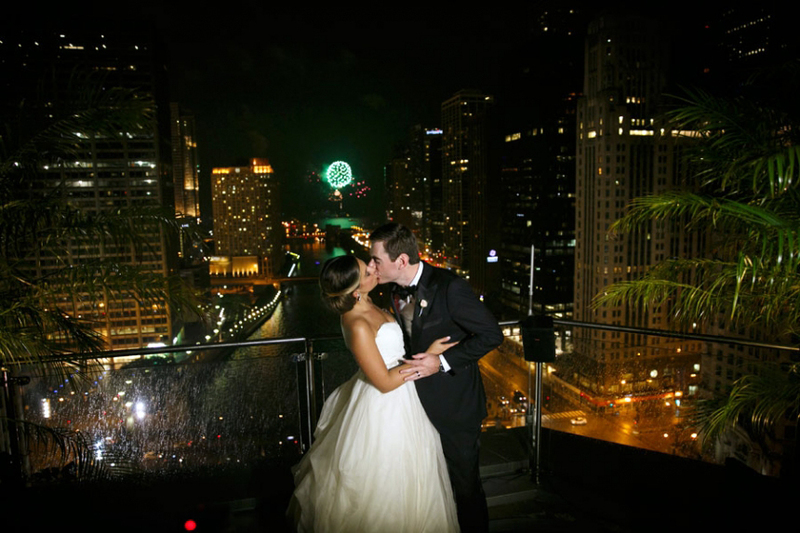 We can not believe another year has come and gone! 2016 is already shaping up to be an amazing year with new customers, lots of new brides and grooms, and new events coming in every day. In celebration of what we already know is going to be a wonderful year, our online store is 25% off through Monday (01/04)! 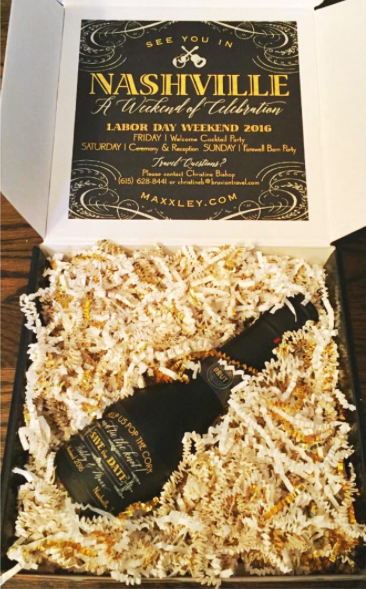 This offer includes our swanky 2016 desk calendar, stationery, and gift items. 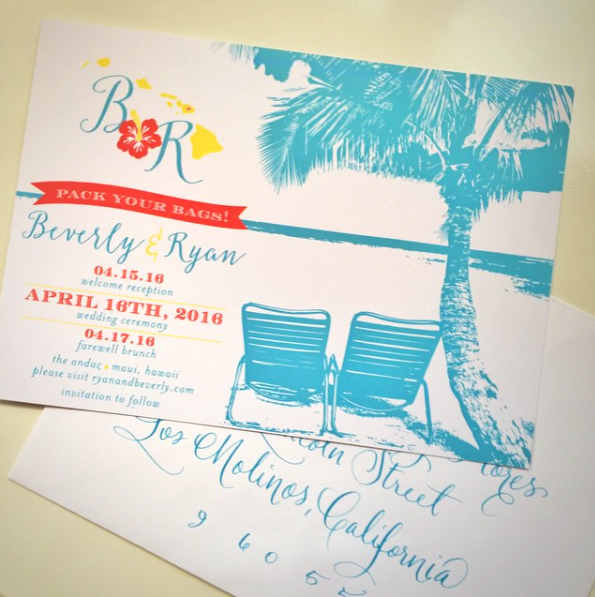 Make sure to use code CHEERS2016 at checkout! Thank you to each and every one of you for an unforgettable 2015. We are looking forward to working with you in 2016! This is why we are THANKFUL...$25 Calendars! Not only are our hearts full, but our bellies too! We have had the most wonderful time being home with our families for this Thanksgiving holiday eating sweet potato casserole, squash casserole, turkey and gravy!! Yesterday had us really reflecting on all that we have to be thankful for....sometimes it is easy to get distracted about what we DON'T have instead of focusing on what we do! We may both still be single looking for Mr. Right but we DO have an amazing business that we started from the ground up with no loan, no nothing...just blood, sweat, and ramen noodles. (there were actually LOTS of tears too..LOL!) And for THAT, we are thankful. We have SO many repeat customers and we love watching your families grow with birthdays, birth announcements, and Christmas cards! We know it is cliche to say, but it IS SO TRUE. We have so many customers that we feel like are our long lost besties, that we have never even met. We care about you all, your families, and the products we send out to you with our names on it! This Thanksgiving let us all be thankful for what we have. We each may have different circumstances, different life stories, different surroundings, but we all have something. So for that, we are offering our 2016 calendar for $25!! (CODE IS THANKFUL!! ENTER IT AT CHECKOUT!!) 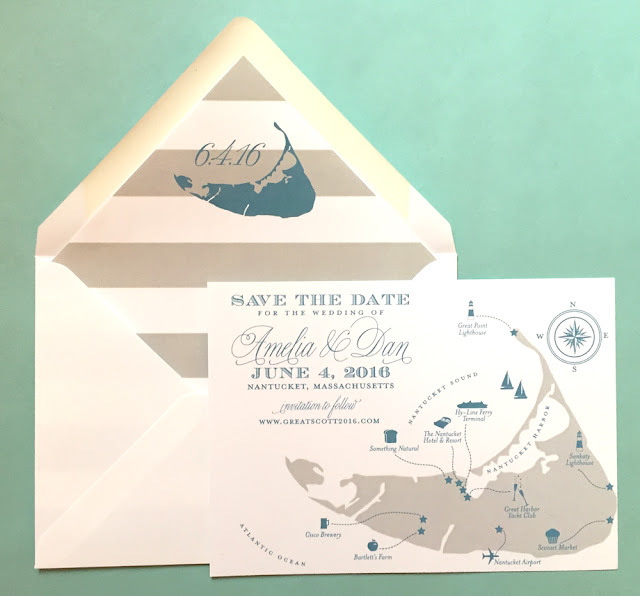 Y'all...it is seriously the cutest thing we have ever seen and each month just gets better and better; die cut, chic, and topped with animals (think camels, monkeys, and cheetahs). We upped the ante on the lucite stand as well this year with a heavy duty acrylic! These make the best gift for any and every one; Secret Santa, teachers, your best friend, your sister in law, your niece, you name it. Enjoy the sale and know that we are grateful for each and every one of you! Click here to purchase yours today! While the calendar might show Halloween is the holiday that is fast approaching...our studio calendar says differently. We have already skipped ahead to Christmas! 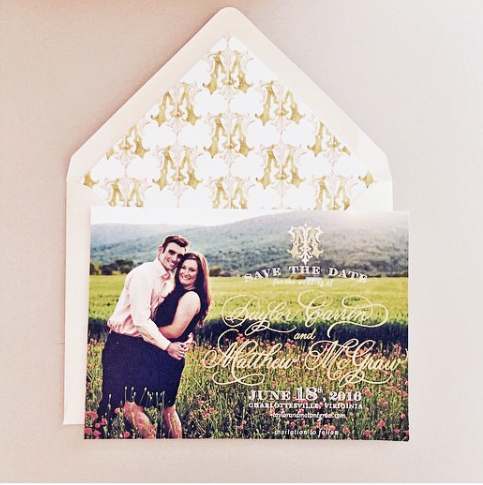 We are in the midst of custom holiday card season, with incredible cards being shipped out every day. 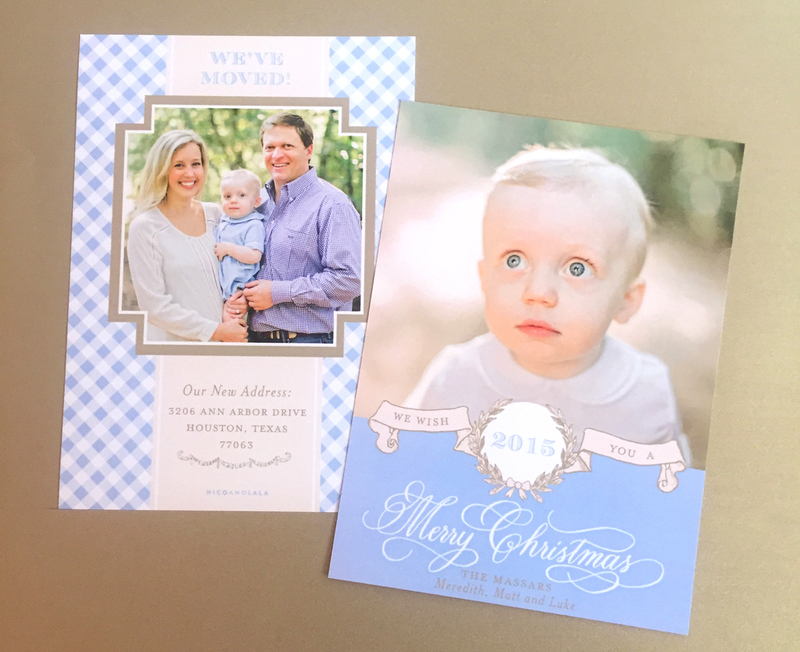 Haven't contacted us yet about your family's 2015 custom Christmas card? No problem! We can still do your card! For those who have already contacted us and took advantage of our 20% off deal (by submitting their design fee before 10/15), we have a friendly reminder that Christmas card pictures are due no later than November 1st (that's Sunday)! 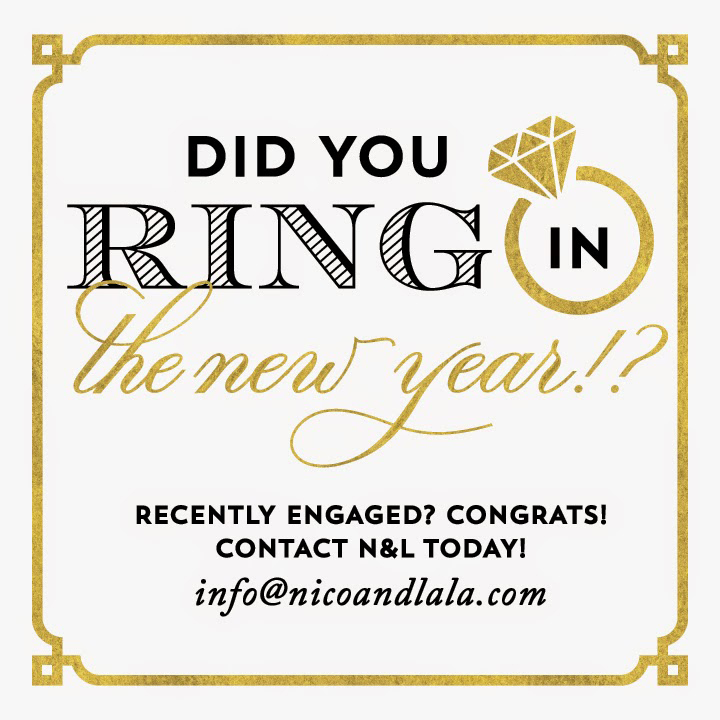 Please send all pictures to custom@nicoandlala.com no later than Sunday to take advantage of the 20% off. 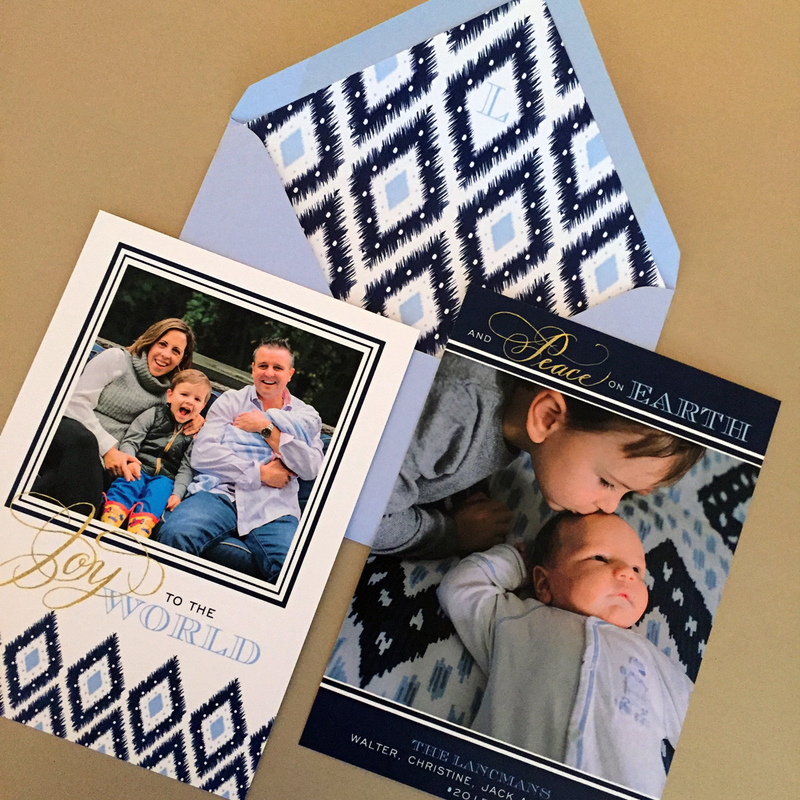 If you haven't contacted us yet about your 2015 holiday card, or didn't take advantage of our deal...no problem! 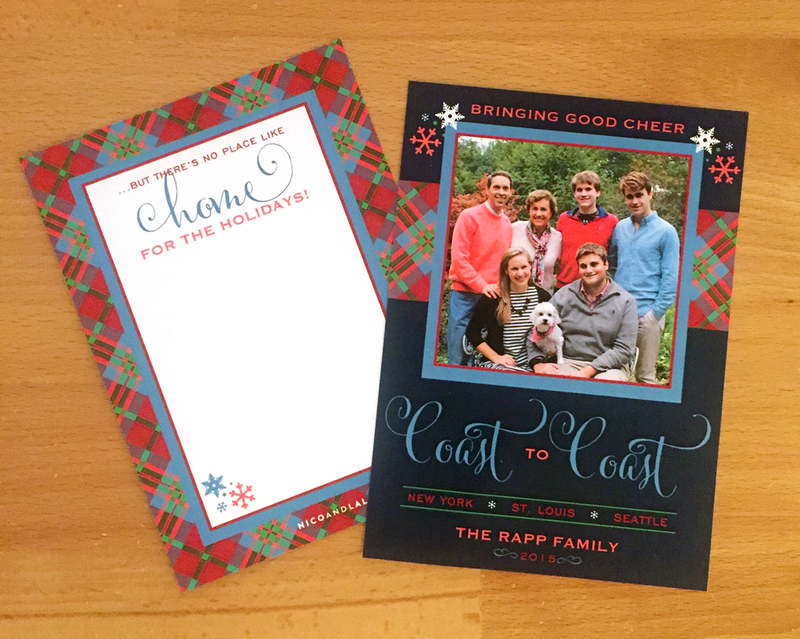 We are still accepting custom holiday card orders. Want to get started? 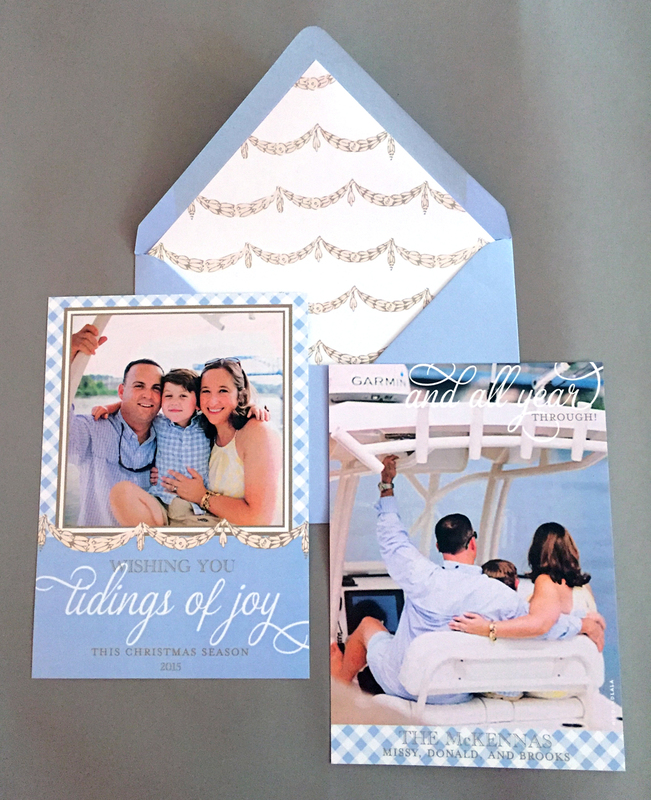 Fill out our custom holiday card form on our website, and we will send you pricing information. Need Christmas card inspiration? 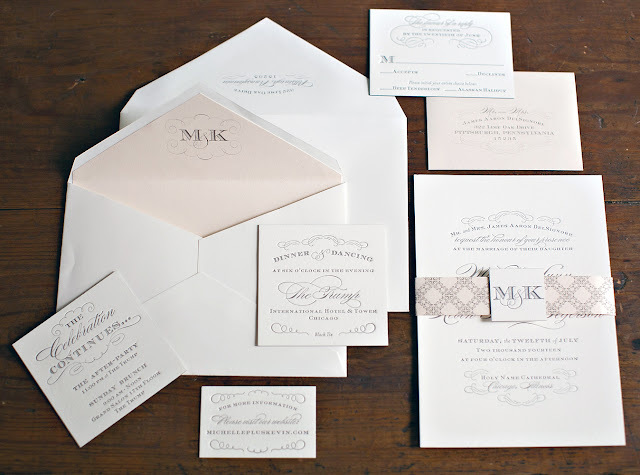 Take a peek at some cards we've already sent out this year! 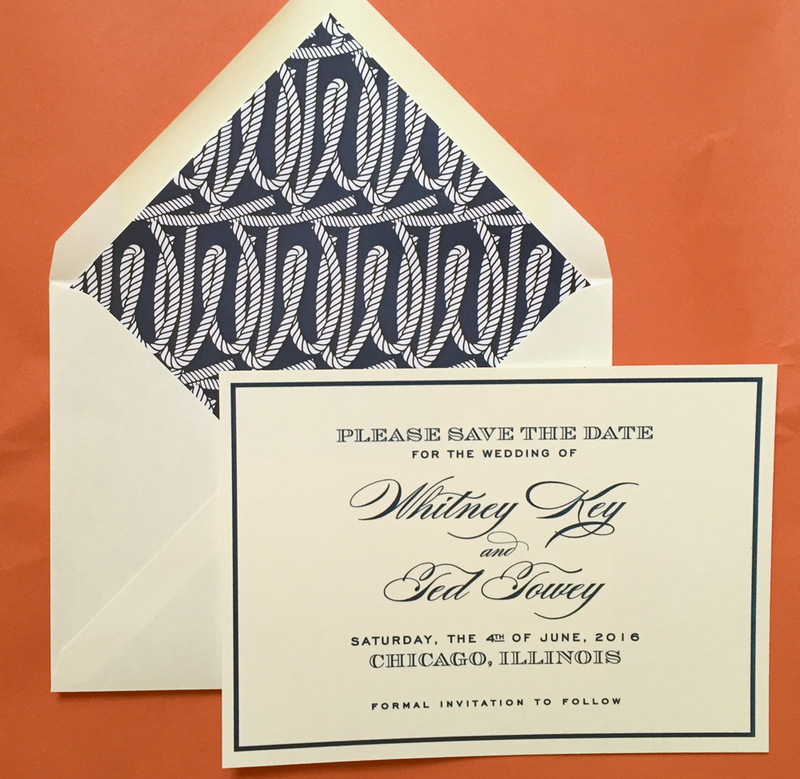 We love a good Ikat pattern...especially when the bold pattern is combined with elegant calligraphy. 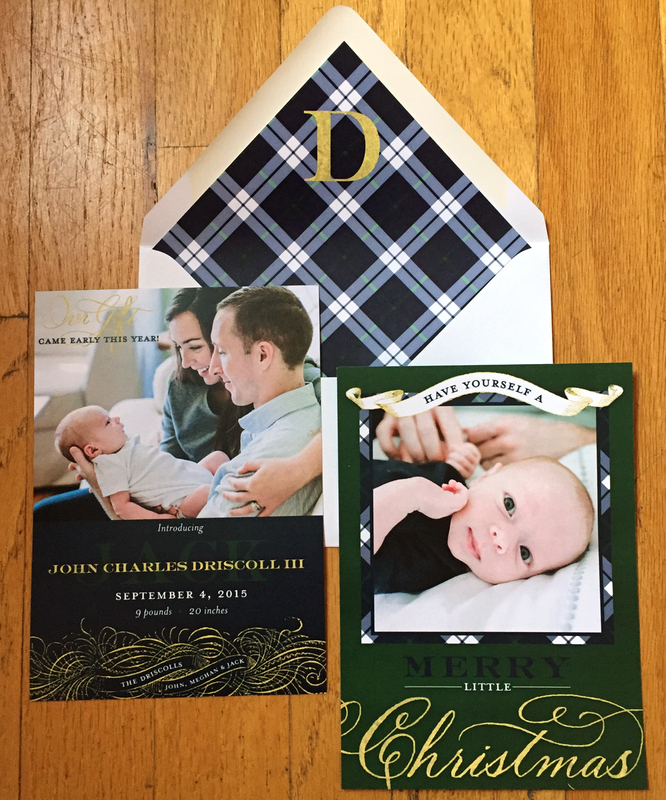 The contrasting styles make for one pretty Christmas card! 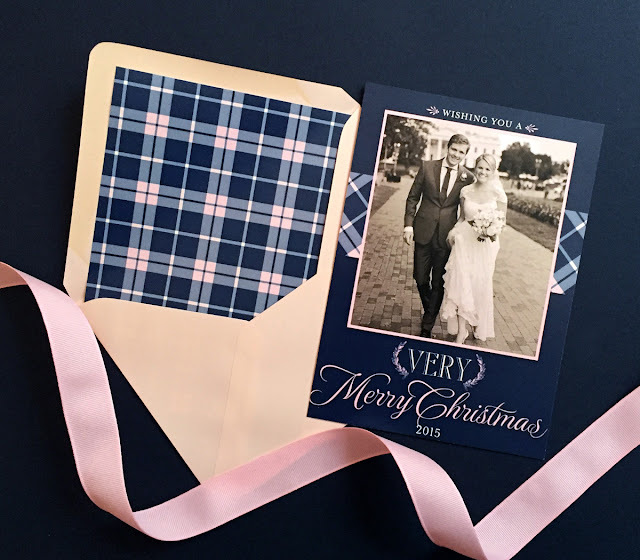 Wishing you tidings of joy with this Southern (and swanky) Christmas card! One of our favorite Christmas cards to design is a card that also acts as a birth announcement. Welcome to the world baby Jack! For the family who isn't afraid of color and lives all over the country...we designed this swanky "coast to coast" Christmas card! Looking forward to sharing more of our swanky designs as the holiday season progresses! Just four days until the spookiest day of the year...boo!! With Halloween right around the corner, we're feeling inspired by all things festive (hello, Pumpkin Spice Latte). So today we're sharing some of our favorite Halloween inspired invitations, as well as some Halloween party ideas to help you put the spook in your spook-tacular Halloween weekend. Brother and sister, Ryder and Lily Brooks, have birthdays close to Halloween. So to celebrate both of their big days, their mom threw them a joint Halloween themed birthday party! 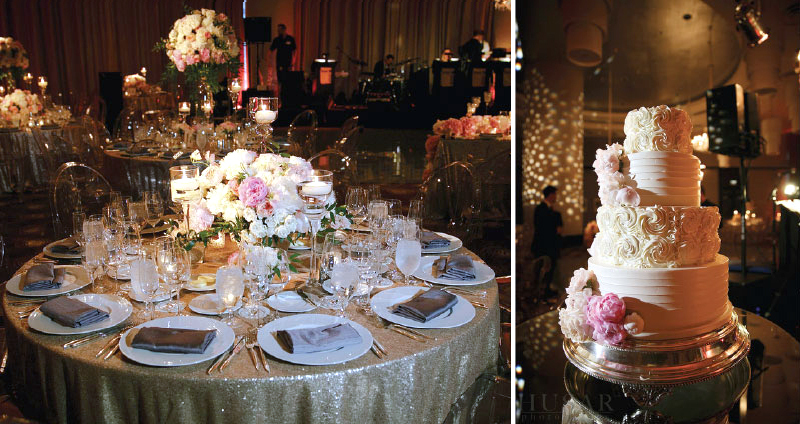 Since this party had guests of all ages attending, their invitations were full of treats (no tricks involved). We focused on bright colors, bold patterns, and some fun Halloween accents like kids in costumes and a pumpkin! 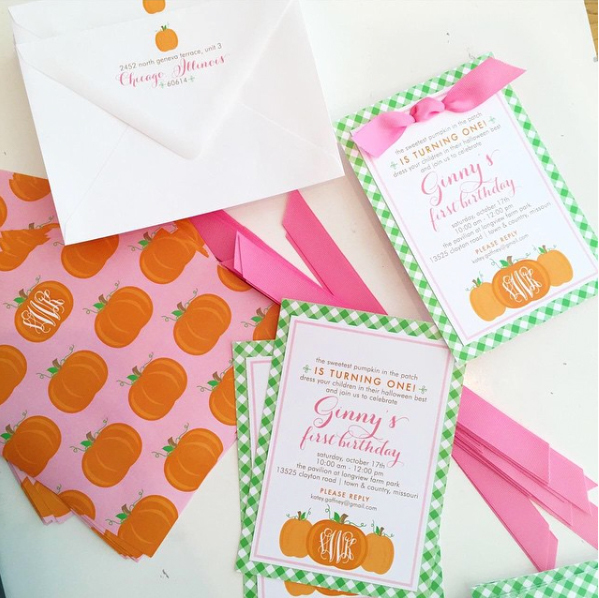 To keep this first birthday invitation sweet, while still getting guests in the Halloween spirit, we incorporated traditional green gingham, a monogrammed pumpkin, and of course...a bright pink bow! 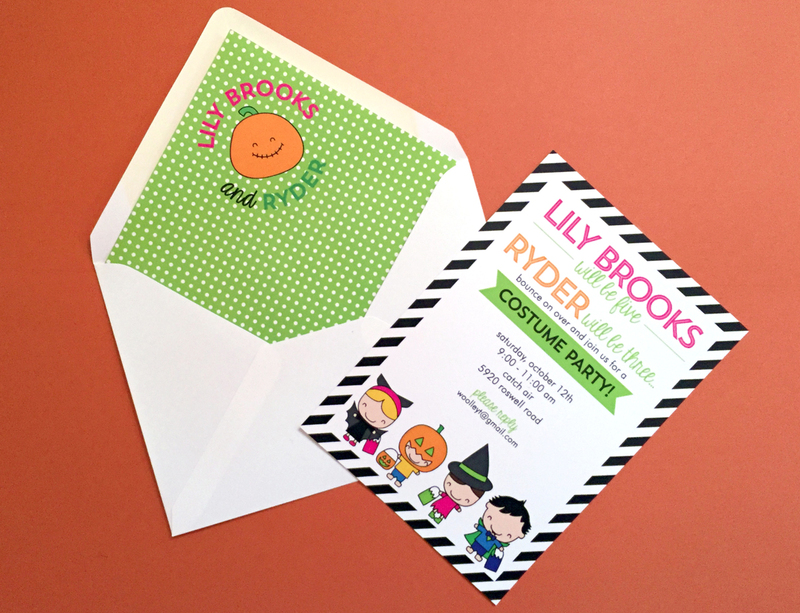 These sweet Halloween invitations were finished with a monogrammed pumpkin envelope liner. Even if you're not throwing a Halloween party, having a festive front porch for trick-or-treaters to enjoy is a must. This fall, our favorite way to give your front steps some swank is with mumkins! 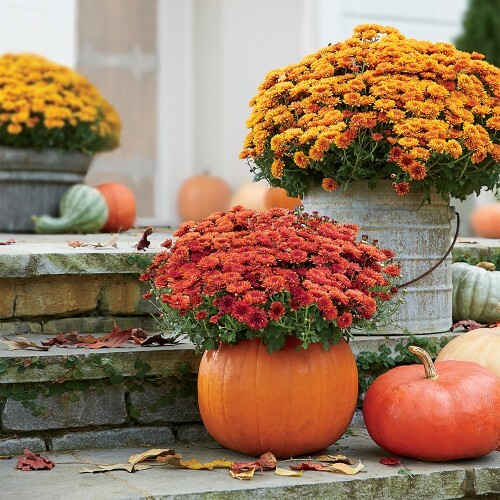 Combining two of our favorite fall elements, mums and pumpkins, proves to be a winning combination. For a step-by-step "how to" to carve your own mumkin, visit Southern Living's website. When it comes to Halloween decor, we tend to gravitate towards more elegant ideas instead of scary. 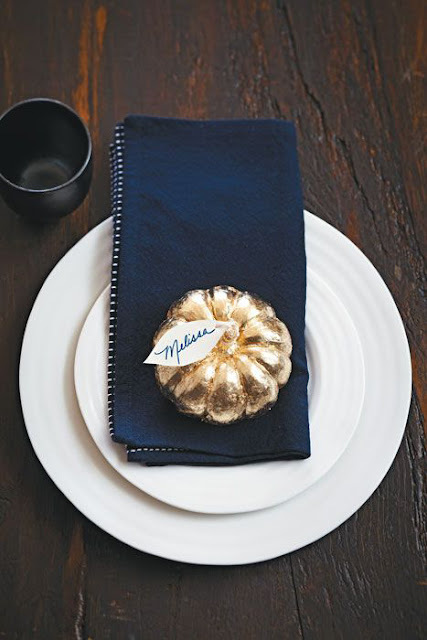 Which is why we love the idea of spray painting mini-pumpkins gold. These pretty pumpkins can be used in a large variety of ways, but we love the idea of placing a pumpkin at each seat to act as a placecard for your guests. We are full supporters of a good festive cocktail! Especially when it makes one of our favorite summer drinks (sangria) appropriate for fall. 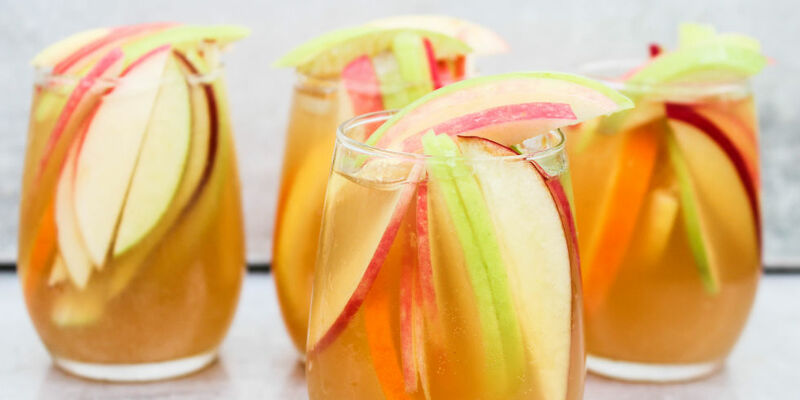 We're excited to try this apple cider sangria to get ourselves in the Halloween spirit! Get the full recipe over at Delish. If champagne is more your thing, we've found a way to put a Halloween spin on your bubbles. 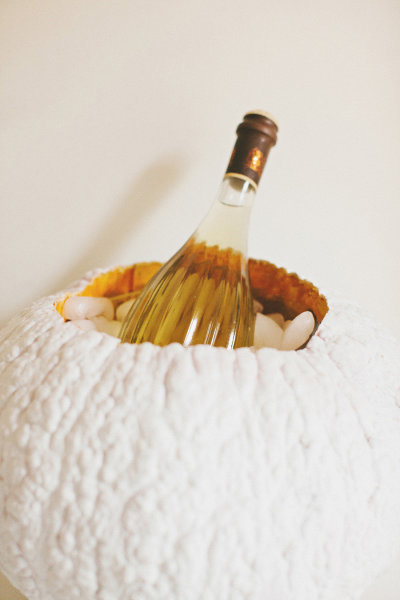 Our friends over at Style Me Pretty came up with the brilliant idea to hollow out the inside of a pumpkin to chill champagne. We're definitely incorporating this idea into our Halloween festivities (but spray painting our pumpkin gold). 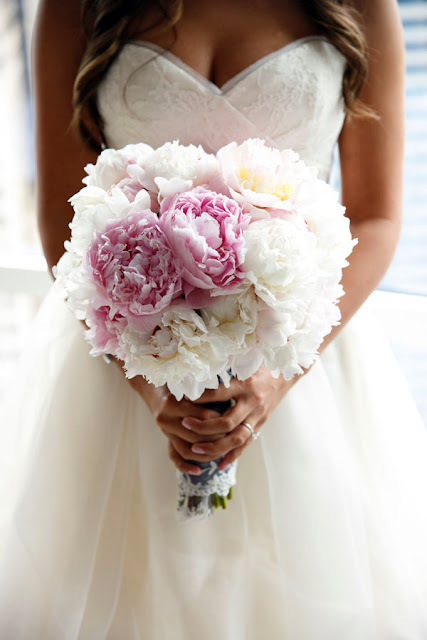 See the full how-to on Style Me Pretty! After you hollow out your pumpkin to chill your champagne, what's a girl to do with all the leftover seeds? That's where Waiting on Martha's spicy and sweet toasted pumpkin seed recipe comes in. 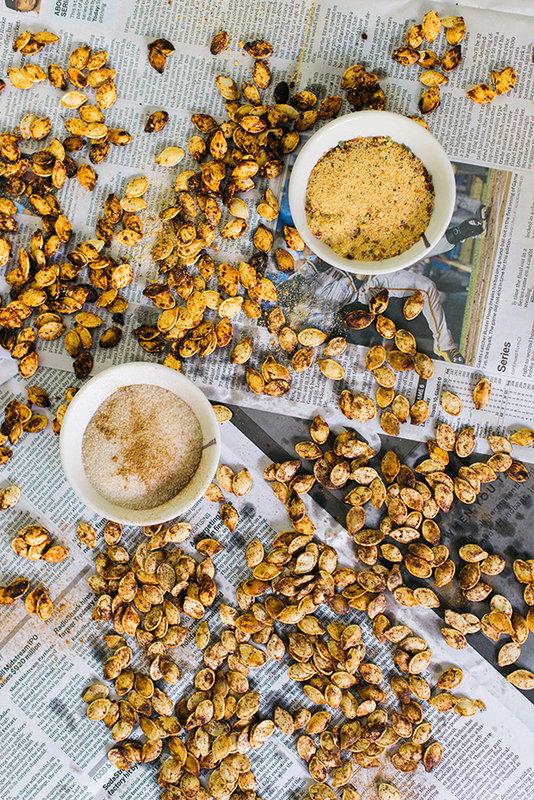 The perfect snack for your fall festivities! Speaking of Halloween snacks, we're always looking for cute (and easy) ideas to entertain our guests. These Mummy Nutter Butter treats would be a big hit with both kids and adults! 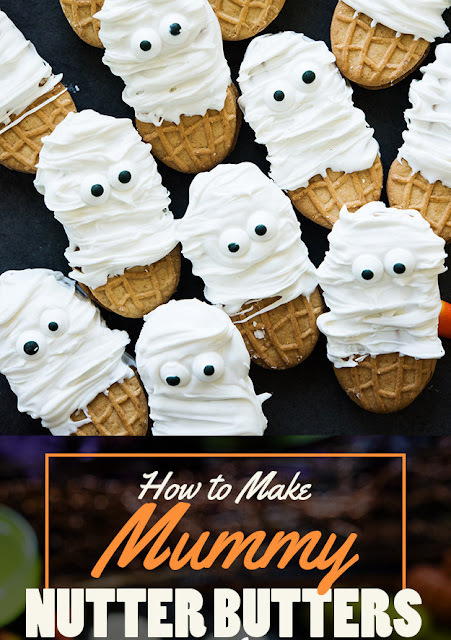 To make your own Mummy Nutter Butters, visit our friends at Buzzfeed. What good are Halloween party ideas without some swanky pumpkin decorating inspiration? This blue and white beauty caught our eyes WEEKS ago!! 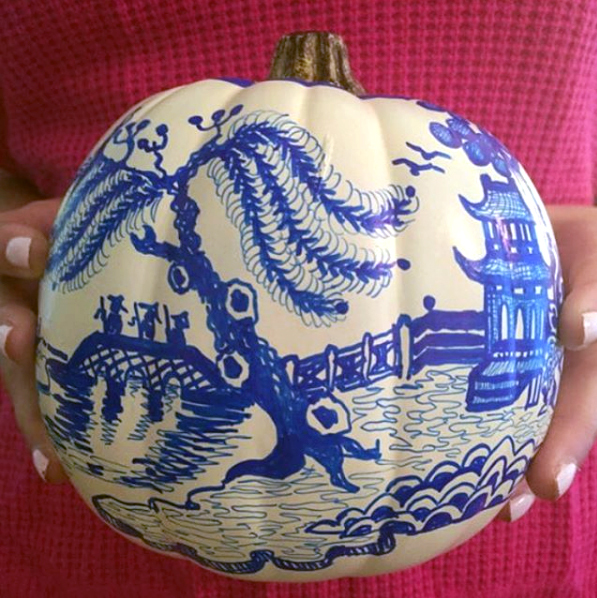 How swanky is this Chinoiserie pumpkin? 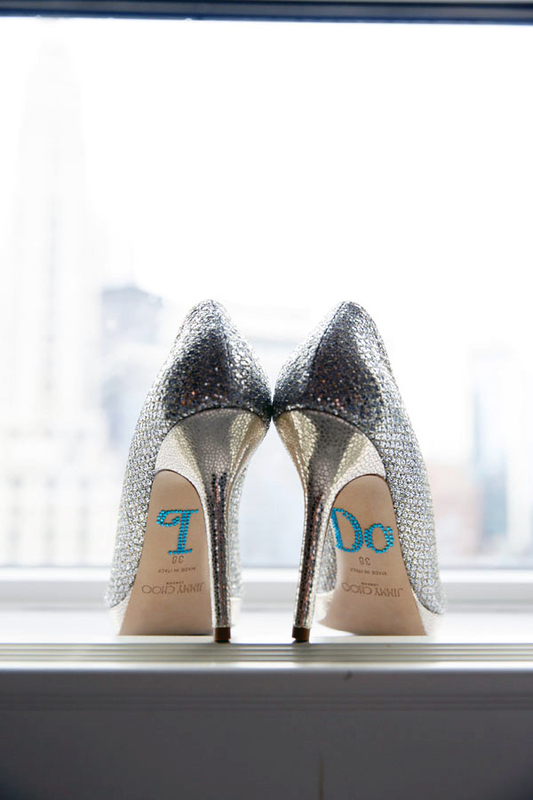 If you're brave enough to attempt your own, all you need is some white paint and different width blue Sharpies. If you're not confident in your art talent, you can buy your own from Indigo Home! We love pumpkins, and we love confetti. So we think this idea to glue confetti to your pumpkin (essentially turning your pumpkin into a party) is great!! 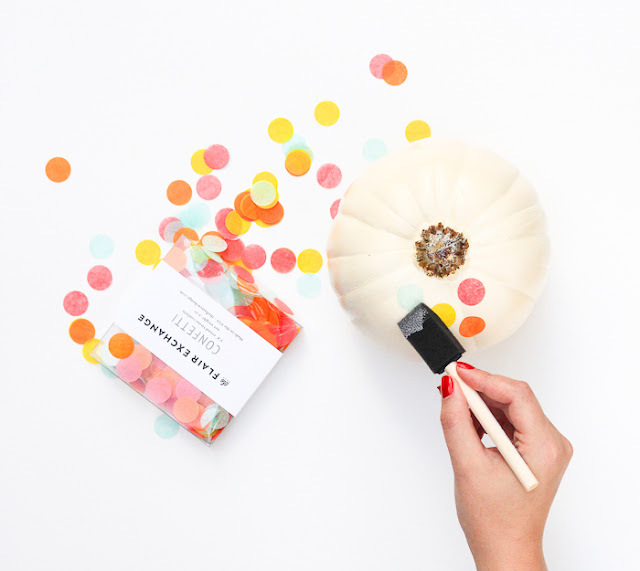 To DIY your own confetti pumpkin, visit The Crafted Life. 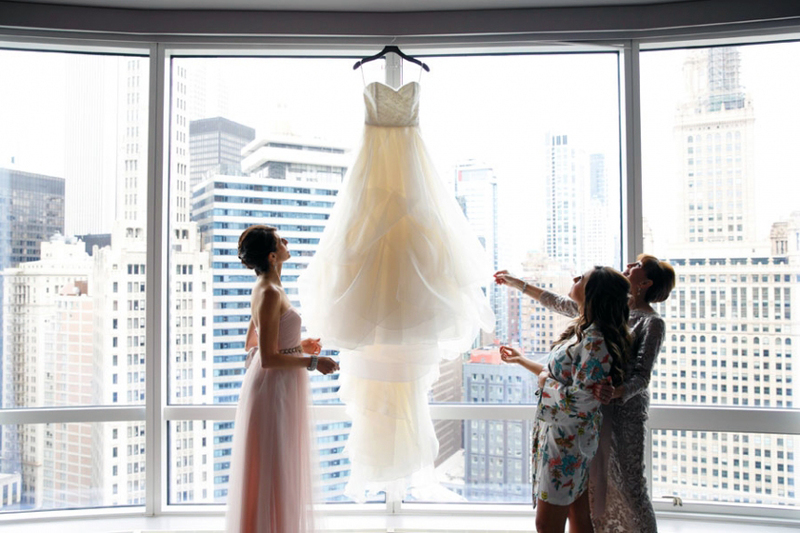 Michelle and Kevin's blush and gray wedding, held at The Trump Hotel in downtown Chicago, is the epitome of an elegantly branded wedding from beginning to end. 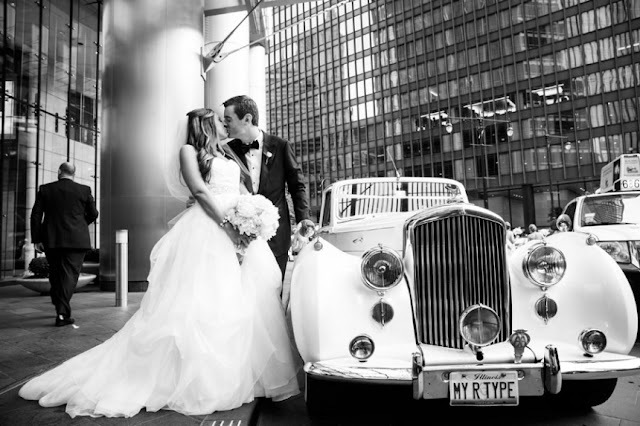 The couple's custom wedding monogram graced everything from their Chicago save the dates, wedding website, invitations, and even the bride's custom iPhone case! 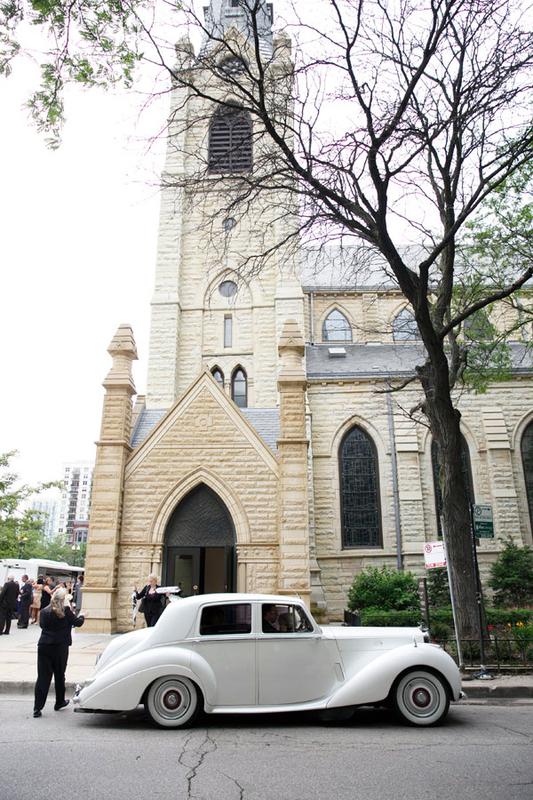 Their wedding was the perfect mix of classic elements, romantic colors, and luxurious extras...all in an exquisite downtown Chicago setting. We couldn't be happier with how beautifully everything turned out for this Chicago wedding at The Trump Hotel! 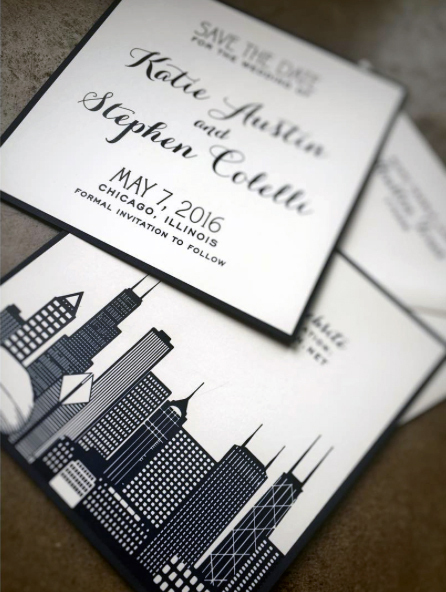 The branding for Michelle and Kevin's big day started with the couple's unique Chicago save the dates. 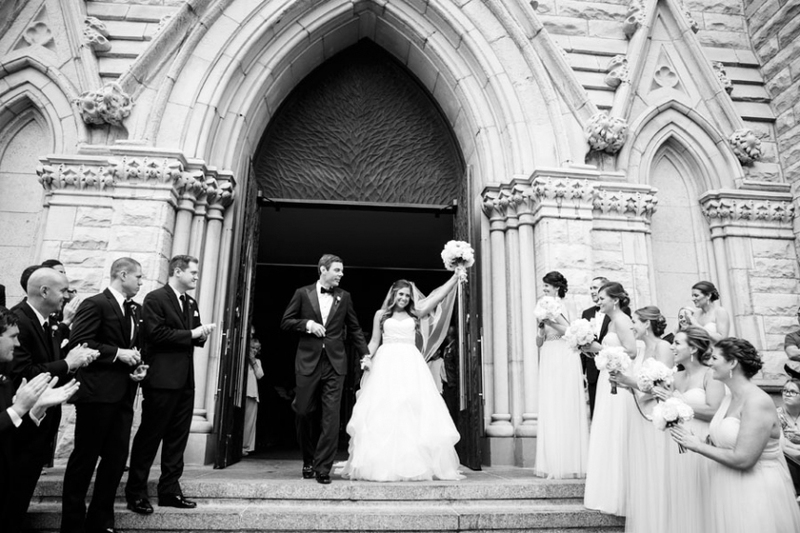 Many of their wedding guests traveled from out-of-town for their wedding. So for the couple's save the dates, we decided on a tri-fold design to accommodate all of their travel information. The tri-fold design also allowed us to highlight their custom wedding monogram (printed prominently on the front) and their adorable Chicago engagement pictures! 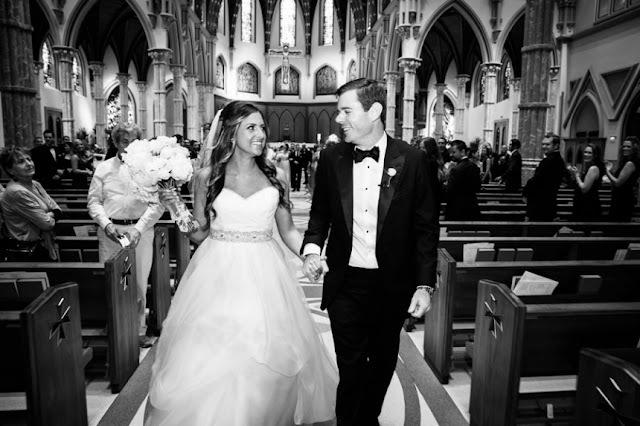 Since a majority of the couple's guests were from out of town, Michelle and Kevin decided they wanted a swanky wedding website, that coordinated with their save the date (of course)! 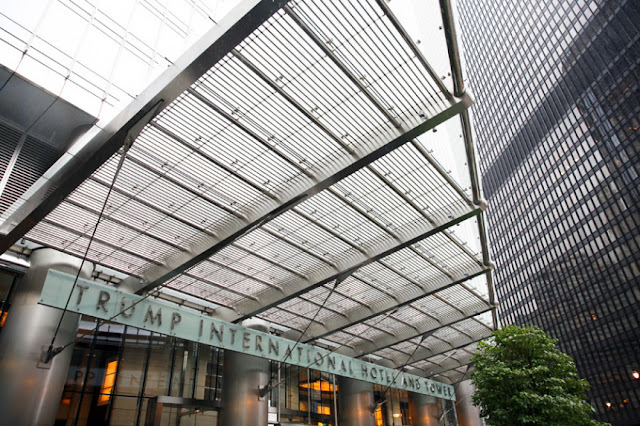 All of the travel information and accommodation's were available on their website, making it easy for out of town guests to make their arrangements. It also included a link to their wedding blog, a photo gallery, and even information on their bridal party! 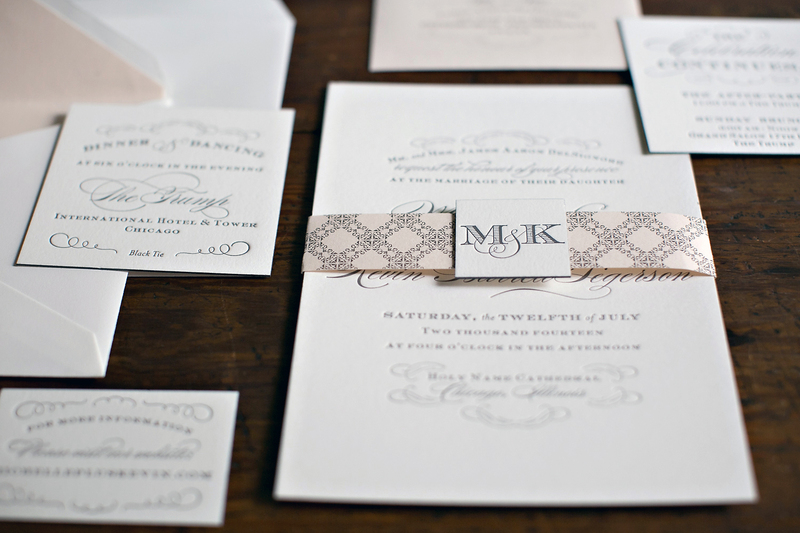 When it came time to design their Chicago wedding invitations, the couple knew they wanted to keep design pretty traditional but with a modern twist! 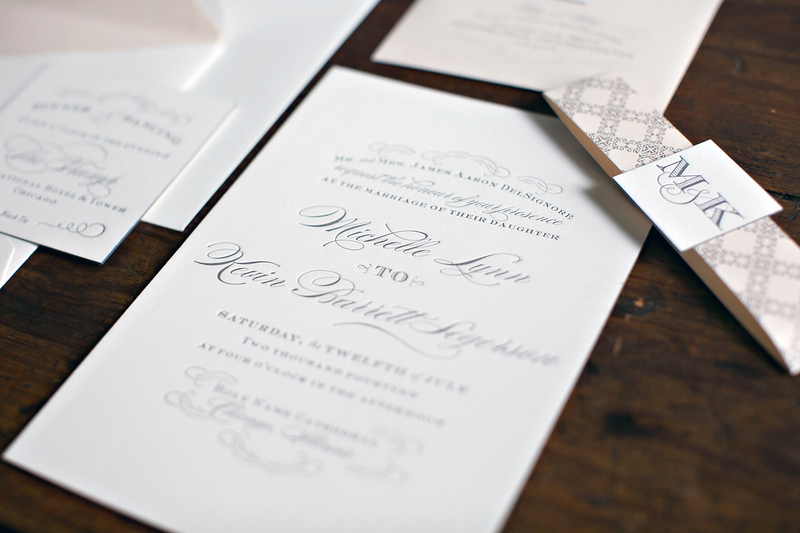 So their wedding invitation was printed in gray letterpress (which is both classic and beautiful), and included unique accents like gray edge painting and a patterned bellyband. 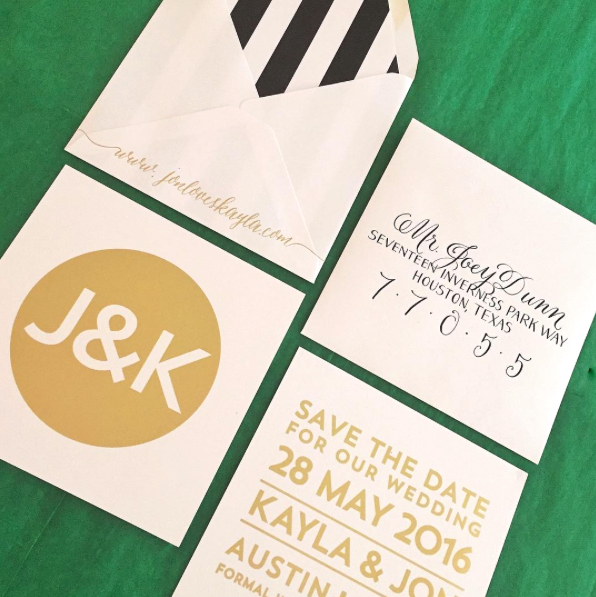 The entire invitation ensemble was sealed with their wedding monogram! 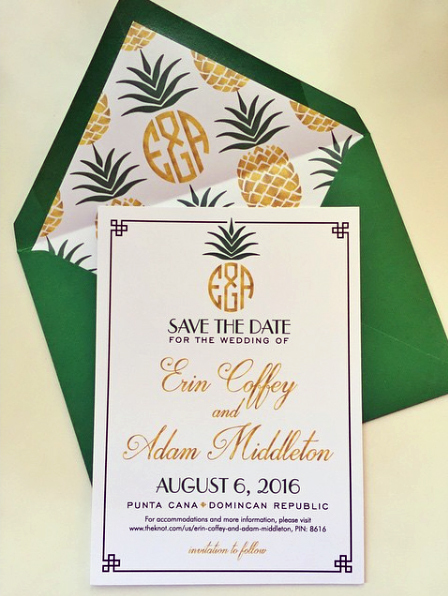 Michelle and Kevin's elegant programs were printed in gray thermography and featured their new married wedding monogram on the front! 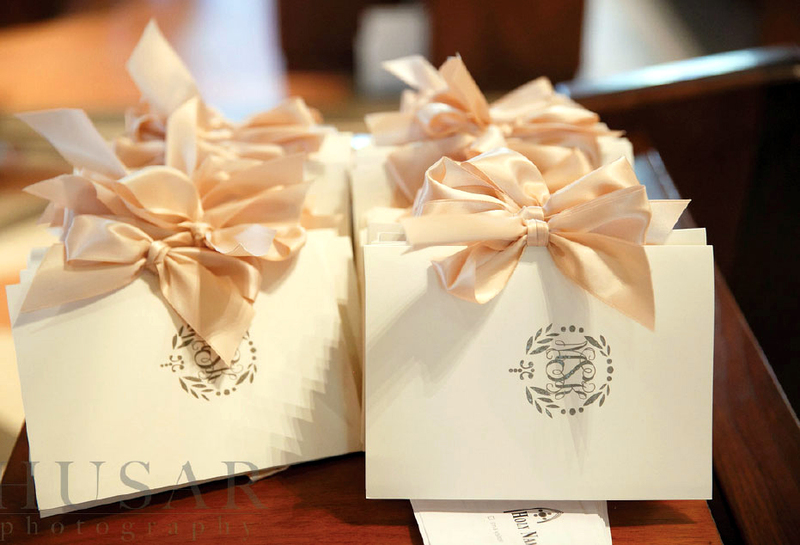 We finished the elegant booklet with a blush satin bow! 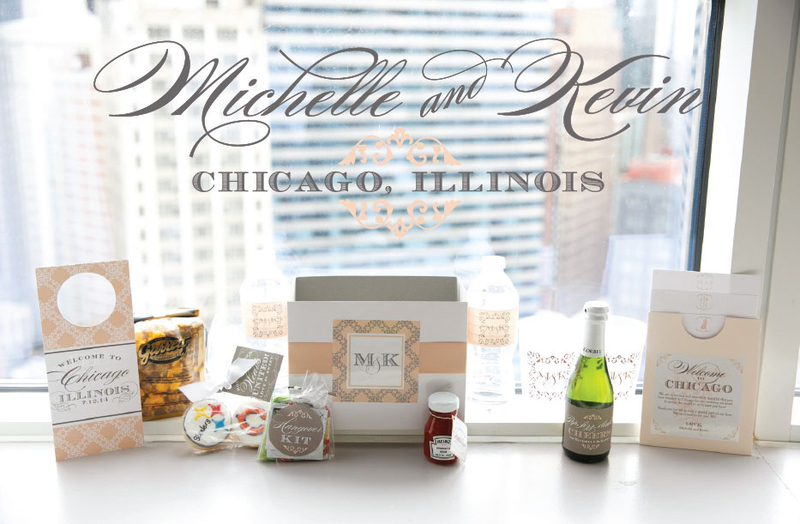 To properly welcome their guests to the Windy City, we helped Michelle and Kevin create Chicago wedding welcome boxes. 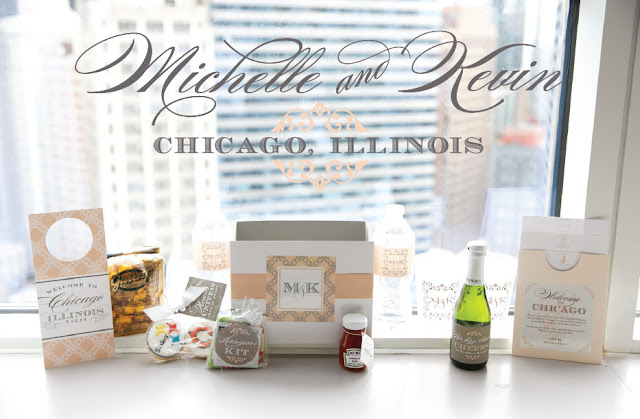 Their boxes contained goodies like hangover kits, hotel door signs, Garrett's Chicago mix popcorn, a little bottle of Heinz Ketchup, two custom cookies paying tribute to the couple's favorite NFL teams, and a bottle of champagne with monogrammed cups. 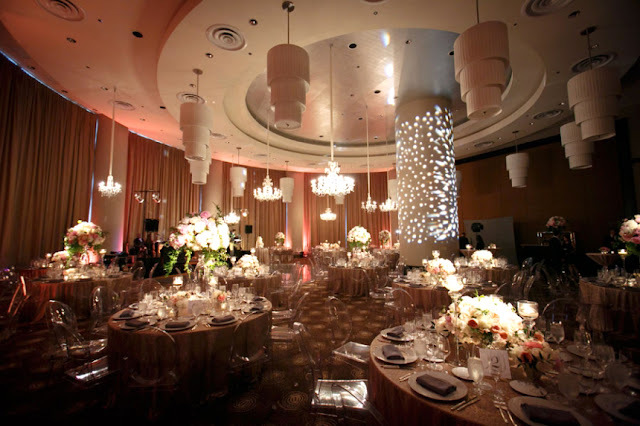 Talk about swanky! Each box was wrapped with blush ribbon and was finished with a monogrammed sticker. 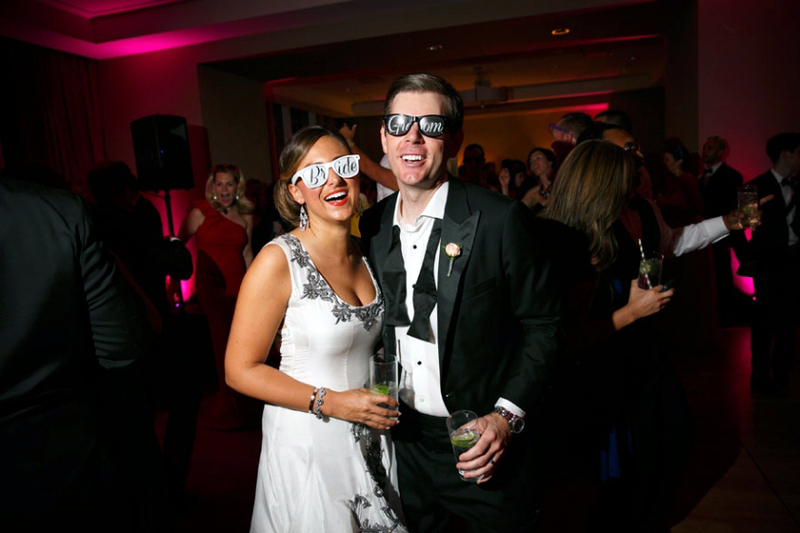 In addition to the rest of their wedding swag, we also helped the couple brand their wedding reception with round menus, cocktail napkins, coasters, and social media signs! 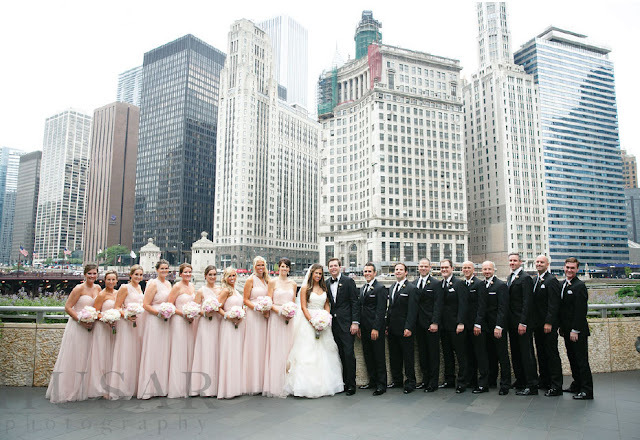 A beautiful Chicago wedding for one of our favorite couples! 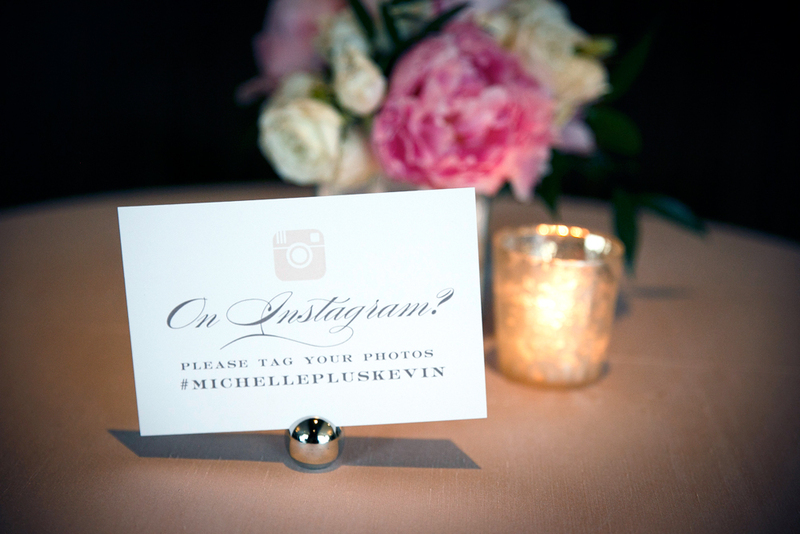 Congrats to Michelle and Kevin (who just celebrated their first anniversary this past summer)! !